Sunbrella ® offers the most comprehensive and dependable line of outdoor fabrics. Sunbrella fabric ® is nearly impervious to decay caused by sunlight and exposure to the elements making it an ideal fabric for use on outdoor furniture cushions or indoor cushions which are exposed to direct sunlight. Other fabrics will fade and fall apart. If you're not familiar with Sunbrella Fabric ®, it comes in a range of textures from linen to chenille. Sunbrella ® is the leading brand of exterior UV resistant and interior UV resistant fabrics. Started in 1961, Sunbrella ® began with specialized awning fabrics. This demonstrated their strength from the start of the business. Check this box to use our Sunbrella ® fabric yardage calculator. 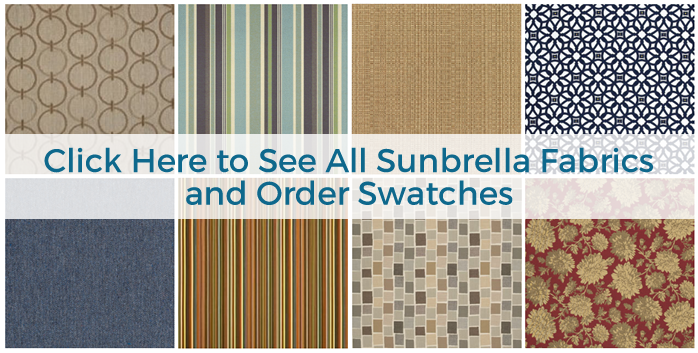 Choose a shape and find out the total number of yards of Sunbrella ® fabric you'll need. Check this box to allow our expert seamstress to sew Sunbrella ® fabric for you! 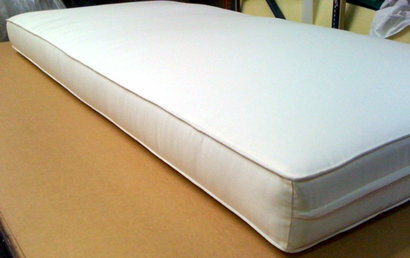 Specify your shape and dimensions and receive a price quote for us to sew your Sunbrella ® fabric cases for you. To order by the yard, click here to see fabric swatches and then enter the number and name of the fabric here. Then enter the number of yards of Sunbrella ® fabric you want to order. Enter number and name. Example: "5403-0000 Canvas Jockey Red"
Sunbrella ® fabric minimum order is one yard. Orders for more than one yard can be ordered in half-yard quantities. For half yards, use a decimal fraction (like 2.5). 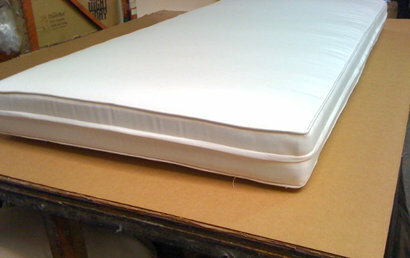 It is important to remember that when your Sunbrella ® Fabric cushion is larger, it should have a zipper on three sides. Front of Sunbrella ® cushion with a zipper on three sides. Back of Sunbrella ® cushion with a 3-sided zipper. Sunbrella furniture fabrics are certified by the GREENGUARD Institute’s Children and Schools standard as contributing to healthy indoor air by being a very low emitting interior product. Sunbrella ® fabric offers a range of fabrics for a range of uses. Its most commonly used in applications that expose it to the sun. While most materials fade and decompose in the sun, Sunbrella ® survives in all its vibrant colors. 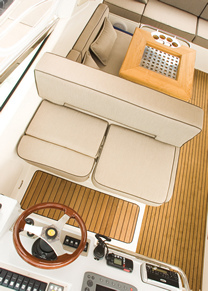 You can obtain Sunbrella ® fabric for awning, interior upholstery, and outdoor fabric upholstery. Sunbrella ® fabrics offer such a wide range of patterns, they are sure to have a material and color option that you'll be happy with. Another big plus of utilizing Sunbrella ® fabric is their commitment to sustainability. All Sunbrella ® consumers are able to take advantage of their recycling services. This means that they will take your old beat up Sunbrella ® cushions and recycle the material to be used again! Another factor that tends to harm our environment is the chemicals and run-off from the dying of textiles. Sunbrella ® not only avoids using effluents associated with dying processes used by the majority of manufactures, but also has a unique coloring process that reduces the waste-water and energy needed to produce the beautiful fabrics. Sunbrella ® fabrics are so strong and durable that they are constantly endorsed by the people who purchase them. 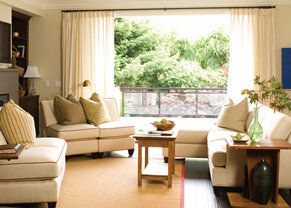 Sunbrella ® also has a GREENGUARD certificate for indoor air quality, insuring a safe and fashionable living space. Sunbrella ® fabric awnings were the original purpose for Sunbrella ®. Sunbrella ® is so successful at creating awnings that The Skin Cancer Foundation suggests using Sunbrella ® to help aid you in keeping your skin looking young and healthy. Sunbrella ® easily adapted the Sunbrella ® fabric technology to a lighter, more comfortable material in their interior and outdoor fabric upholstery lines. Be wary about choosing a Sunbrella ® fabric awning material for use as upholstery material; it is way too stiff. Take a moment to read through the cleaning instructions. Since Sunbrella ® fabric is created in a unique fashion, Sunbrella ® fabrics typically have a unique washing method.